DISCLAIMER: This article is not intended to promote or sell a product in any way, but rather to explain how research can be applied pragmatically towards the development of clinical rehabilitation technologies. The Scoliosis Traction Chair is not available for sale to the general public, or even to licensed Doctors of Chiropractic. It is only sold to doctors who are certified in the system of chiropractic scoliosis correction developed by the CLEAR Scoliosis Institute, and their patients. Dr. Dennis Woggon, the founder of the CLEAR Scoliosis Institute, developed the concept of the Scoliosis Traction Chair (STC) in 2002, gradually refining it over the years. The idea behind the Scoliosis Traction Chair was straightforward; could it be possible to reverse a case of scoliosis into a “mirror-image” of itself, and find ways of keeping it there, without the use of a brace? The concept of a chair was appealing for two main reasons. First, it removed the influence of the legs and lower extremities upon the patient’s posture, ensuring that the head, spine, and pelvis would be isolated and could be targeted more directly. Second, it still required the patient’s muscles in the neck and torso to react and engage to maintain an upright, stable position. The armrests and back rest could be adjusted to influence the symmetry of the shoulders and the shoulder blades. If the right shoulder was higher than the left, for example, the left arm rest would be raised to reverse this. Similarly, the back rest could be positioned to induce positive de-rotation forces into the rib cage. Inclined seat cushions and wedges can be strategically placed to balance out the pelvis and influence the sacrum (tailbone), the foundation of the spine. A low-force spinal traction component was incorporated into the chair which helps to relax the muscles by reducing their burden of supporting the head and neck, while helping to reduce forward head posture and restoring the natural alignment of the bones of the neck (the sagittal cervical lordosis). Additional straps and belts were designed to pull the spine into a mirror-image configuration in the side-to-side (coronal) plane, while also de-rotating and uncoiling the spine in the top-down (axial) dimension. X-rays taken of patients in the Scoliosis Traction Chair demonstrate not only improvements in Cobb angle, but also in the rotation of the spine; in some cases, these results are superior to bracing. In the initial radiograph, the patient demonstrates a 59 degree thoracic Cobb angle and 22.5% rotation of the thoracic apical vertebra (T6), and a 60 degree Cobb angle with 24.5% rotation of the apical vertebra (L1). In brace, the patient’s Cobb angles measure 55 and 49 (a 4 and 11 degree improvement respectively), and the rotation measures 35.1% and 29.5% (a 12.6% and 5.0% worsening respectively). In the Scoliosis Traction Chair, the patient’s Cobb angles measure 29 and 14 degrees (a 30 and 46 degree improvement respectively), and the rotation measures 19% and 17.9% (a 3.5% and 6.6% improvement respectively). Will the STC correct my scoliosis? How much does the STC cost, and where do I buy one? The STC is sold through Vibe For Health, and is only available to patients under the care of a CLEAR Certified doctor of chiropractic. The retail price of the STC is $4,395, although refurbished chairs are sometimes available. International STC’s can be more expensive due to the cost of designing the vibration motor for different electrical specifications. For more information, visit www.VibeForHealth.com. A patient’s first experience with being placed in the Scoliosis Traction Chair can be awkward at first – much like being placed into a scoliosis brace for the first time. However, STC therapy should not be painful; if it is, the set-up of the chair is probably wrong and needs to be re-done. Most patients have no problems being in the STC for 30 minutes, twice daily. Mild side effects from the vibration have been reported, including nausea and dizziness; however, these side effects are rare and tend to go away quickly after the first few treatments. Muscle soreness can occur as well, as with any physical rehabilitation technique that involves stretching the spine and soft tissues. The very first Scoliosis Traction Chairs were modified school chairs, which were customized by hand for each patient. The arm rests were built up and foam blocks affixed via duct tape, according to their individual posture. The entire contraption was then placed on top of a vibrating platform, the purpose being primarily to balance the shoulders. In 2001, research had already demonstrated the effectiveness of vibration in re-modeling posture, and clinical experience had proven the importance of the head & neck in determining the position of the spine below, yet the full potential of this new invention was yet to be realized. Although the initial results achieved through the use of this prototype were encouraging, it was limited in its application in a clinical setting, due to the customized nature. A cervical traction component was added on the next model, and a motor attached directly to the chair. If the chair was turned on without a person seated in it, it would “float” across the floor. If a person was seated in it, more of the vibration would transmit into the floor than into the patient. While attending Palmer Chiropractic School in Davenport, Iowa, Dr. Clayton Stitzel had the good fortune to meet and be mentored by Dr. Dennis Woggon. The work that Dr. Woggon was doing with scoliosis patients was innovative and challenging, and Dr. Stitzel was inspired to join him in this endeavor. Dr. Woggon had already begun developing a treatment protocol that used vibration and traction to successfully treat patients with scoliosis. The two doctors were absolutely on fire with enthusiasm about the potential of making a significant difference in the lives & spines of patients who many claimed could not be helped by chiropractic care. Dr. Woggon and Dr. Stitzel spent countless hours on email & the phone discussing techniques that would achieve the outcome that they so desired for their patients. It soon became apparent that the two needed the assistance of someone who could turn their ideas into reality. Dr. Stitzel suggested his father, Mr. John Stitzel, a retired school administrator from Manheim, Pennsylvania. John had years of experience in engineering & a great deal of mechanical ability, and, through his son, understood how this information applied to the biomechanics of the human spine. This combination of Mr. Stitzel’s technical know-how and the clinical experience of the two doctors provided the ideal foundation for a piece of equipment which would go on to revolutionize scoliosis treatment for hundreds of doctors & their patients in the years to come. Mr. Stitzel well recalls when Dr. Woggon first presented the prototype Scoliosis Traction Chair to him. At this time, the chair was sitting on a vibrating platform, and a pulley system was mounted to the ceiling to traction the spine. The arms were not adjustable to accommodate individual patient needs, and the back did not swivel. Foam blocks needed to be taped in place for each individual patient, and the un-padded lateral traction straps were tightened in place manually by the doctor. One day while vacationing in Ocean City, Mr. Stitzel and his wife, Helen, were taking their granddaughter for a walk and passed by three wooden kitchen chairs that had been discarded. Proving the old adage about one man’s treasure, Mr. Stitzel was struck by a flash of inspiration upon viewing the unique design of these particular chairs. He asked permission to bring them home, and a plan began to take shape. Numerous ideas were explored while designing, and redesigning the chair. Initially, most of the patients who came to Dr. Stitzel and Dr. Woggon were children or young adults, but increasingly adults were inquiring if they could be helped as well. The design of the Scoliosis Traction Chairs was soon expanded to accommodate adult-sized patients. Dr. Stitzel soon realized the narrow chest and waist belts were very uncomfortable and female patents especially had difficulty tolerating being in the chair for long periods of time. Belt support hooks were added under the arm rests, and Mr. John Stitzel recruited the help of an Amish gentleman who agreed to handcraft leather pads that would distribute the pressure more evenly, making these straps more comfortable for the patient and allowing the patient to tolerate a longer session in the chair. Pads were sent to Dr. Woggon for his evaluation, and their arrival was heralded by a general sigh of relief amongst his patients. The new pads greatly improved the amount of lateral force that could be applied to straighten the spine. However, scoliosis is much more than simply a sideways deviation of the spine; it also involves a compression and a rotation of the spinal column. To achieve the necessary de-compression that would allow the spine to further correct, Dr. Stitzel and Dr. Woggon requested that a cervical traction component be incorporated directly into the chair. Soon, a post and pulley system was mounted on the chair backrest. In addition, John designed it with the ability to rotate, as well as to raise and to lower. This became important later on, as the realization was made that by turning the patient’s head in one direction, the entire spine below would react, thus further enhancing the chair’s effectiveness in rehabilitating scoliosis. Initially, the back rest was stationary, which did not lend itself well to addressing the necessary de-rotation of the spine. Mr. John Stitzel invented another modification that allowed the backrest to swivel, raise, and lower. It could now be positioned in exactly the correct position on the spine and rotated into the patient’s back. Through the attachments of the ribs to the spine, the entire spinal column would react, and x-rays taken on patients while they were in the chair now proved that their spine was being repositioned completely back to the ideal by the 3-dimensional activity of the Scoliosis Traction Chair. The hand-pulled weight belts were replaced with a ratchet system that allowed doctors more precise control on the amount of traction they applied to the patient. It also made it possible for patients to effectively use the chairs in their homes. In the fall of 2004, Dr. Stitzel began using one of the original chairs and one was sent to Dr. Woggon. In the spring of 2005, John Stitzel completed the chair design that is essentially the chair that CLEAR is using today. Hundreds of hours went into drafting plans, searching for components, building and testing prototypes, and making improvements that would ensure the clinical requirements necessary to achieve results in scoliosis treatment. It was time to begin interviewing craftsmen. Copies of the design were taken to carpenters and welders. Mr. Stitzel met with them personally to eliminate all production problems with the design and oversee the product quality. There was only one significant issue remaining. At this point, the vibration component was achieved by setting the chair on a vibrating platform. However, Dr. Stitzel felt strongly that a motor should be mounted directly on the chair, which posed a new problem. The vibration needed to be directed into the chair and isolated from the floor, necessitating a re-evaluation of the chair’s foundation. In the winter of 2005, a Scoliosis Traction Chair with a vibrating motor attached was custom-designed and tested in Dr. Stitzel’s clinic. This design was evaluated for more than a year, right next to another chair which was placed on a vibrating platform, allowing Dr. Stitzel to compare the results between patients using only one version exclusively, and encouraging suggestions & comments from other patients who were allowed to use both chairs. While both versions ultimately proved to be very effective, the complete chair has become popular with both doctors and patients for its efficiency, the ease of its use, and its practicality. The Scoliosis Traction Chair went into full production at Lewis Motor Repair in Waite Park, Minnesota, in the winter of 2007. Currently, over a thousand Scoliosis Traction Chairs have been sold to patients & chiropractors, and roughly two-hundred more are sold each year. It is a FDA-registered device, and clinical trials of its effectiveness are ongoing. In 2001, a scientist at the State University of New York in Stony Brook received a grant from NASA to study how whole-body vibration (WBV) could be used to achieve therapeutic benefits to the musculoskeletal system.1 The outcome of his work soon led to a general craze about WBV therapy, with additional researchers at other universities branching off to study other aspects of WBV, and marketers developing numerous platforms designed to capitalize on the research suggesting WBV therapy as a potential intervention for osteoporosis and other common ailments. When the initial studies on WBV began to be published – as is the case with most initial research forays into new technologies – at first the findings were only suggestive of the opportunities for further research. Many times important parameters of WBV therapy – such as the frequency, amplitude, and direction of the vibratory waveform – were not reported, or were described only vaguely. As the importance of these factors in achieving specific outcomes began to be realized, additional studies were performed to determine how changing one factor might influence the results. WBV therapy was first studied for its effects on bone formation, joint flexibility, and muscle tone. As an inductive science, research cannot be counted upon to provide all of the answers. If something has not been researched yet, after all, there can be no relying upon research to prove or disprove its efficacy. Rather, common-sense and deductive reasoning (commonly known as logic) are required. Doctors of chiropractic understand how stimulation of muscle spindles increases stimulation of the cerebellum and other areas in the brain responsible for postural control through the process of afferentation. Researchers trying to understand how WBV therapy increased bone density postulated that it could be because of increased stimulation of postural muscles; as these long, strong muscles contracted, they stimulated bone growth through adaptive responses.2,3 Using deductive reasoning, it was hypothesized that if WBV increased the activity of the muscles, it could also increase the rate of afferentation occurring between the brain and the postural muscles, and thus promote better balance, proprioception, and posture by increasing the rate at which the body and the brain communicate with each other. If this rate of communication is increased, postural rehabilitation exercises performed with the aid of WBV therapy should be more effective than exercises performed alone. Problems with vestibular function, proprioceptive deficits, and issues with postural control have all been observed in patients with idiopathic scoliosis.4,5 These balance-related disorders are also common to another segment of the population; namely, people living with Parkinson’s disease. In a recent study investigating the effect of WBV therapy on improving balance & postural stability in patients with this condition, a significant benefit was found.6 Although the effect of WBV therapy on improving vestibular deficits in scoliosis patients has not been specifically investigated, it is logical to assume that it may be similarly effective. The action of a rigid brace such as the Boston brace, or any inflexible orthosis, is quite simple: it restricts motion. Immobilization results in muscle atrophy and degeneration of synovial joints, including the intervertebral discs of the spine. At the University of Vermont, the biomechanicist Dr. Ian Stokes performed a series of animal experiments that clearly demonstrated when motion was inhibited at the level of the IVD, the structural rigidity of the spine increased.8 This has dramatic implications for scoliosis bracing; if bracing is applied in a case of early-onset scoliosis, and bracing inhibits spinal mobility, could the resultant disc degeneration actually contribute to the development of a permanent spinal deformity? This is a question worth raising, in line with primum non nocere. When compressive forces are applied to the body, the instinctive reaction is for the body to resist against it. By wearing a brace for several hours out of each day, the body develops a neuromuscular pattern of continually resisting against the applied force. When the brace is removed, the rebound effect, combined with muscles weakened by atrophy, could actually lead to increased progression of the scoliotic curvature. Considering how the body responds to compressive forces, perhaps a different mechanism could be applied to achieve better results; namely, tractive or pulling-type forces. Pulling, as opposed to pushing, is less readily resisted by the body, and thus works with the body rather than against it. Greater reduction of spinal deformity could potentially be achieved when the muscles are engaged to facilitate the improvement rather than fight against it or be immobilized by the external forces applied. Another important aspect to consider regarding the scoliotic deformity is its three-dimensional nature. The very term “scoliosis” is misleading, as it implies a lateral curvature of the spine. While scoliosis may be commonly measured and diagnosed in this fashion (namely Cobb angle), the sagittal and axial planes are also involved and contribute to the etiopathogenesis and progression of this spinal disorder.10 For this reason, it is more appropriate to refer to the scoliotic spine as a ‘helix,’ rather than a curve.11 Bracing is fundamentally flawed, due to its inherent inability to address the spine in all three dimensions. CT and three-dimensional x-ray systems consistently show that, even in cases of bracing where the lateral deviation of the spine as measured by Cobb angle is reduced, there is a worsening of the sagittal balance and no effect on the axial vertebral rotation12 (which, through the attachment of the ribs, is primarily responsible for the cosmetic deformity that is considered to be pathognomonic for the disorder of scoliosis). A more effective system of spinal correction should be measured not only by its ability to reduce the deformity in the coronal plane, but also in the other two dimensions (high school experiences aside, most of the people we encounter in life are not one-dimensional). It is interesting to note that axial spinal traction is the earliest described form of treatment for scoliosis, and its role in the management of scoliosis has been well-documented over the centuries,15 yet today spinal traction is seldom used in the management of scoliosis. At one point the Milwaukee brace (the precursor to the Boston brace) incorporated a cervical halter which aimed at providing axial traction to the spine, but it was discontinued due to its social unacceptability as well as its unfortunate side effect of inducing TMJ problems in brace wearers. Currently, traction is used in the orthopedic management of scoliosis only in a hospital setting; under general anesthesia to evaluate the flexibility of the spine prior to surgery, and hence predict the post-surgical prognosis; and, halo traction (pins drilled into the skull and attached to a pulley unit), used pre-operatively to increase the flexibility of the curve and thus the improvement achievable through surgery. The historical foundations & reported benefits of axial traction should not be ignored; the one universal constant acting on all of our spines is gravity. It is common knowledge that the height of an individual is decreased throughout the day, sometimes by as much as a half-inch, due to the effect of constant gravitational loadbearing upon the intervertebral discs. A three-dimensional system of scoliosis management must by its very nature involve axial traction; the only alternative, axial compression, is intrinsically opposed to good spinal health. If traction can be used to increase flexibility of the spine and enhance long-term outcomes, it deserves to reclaim its place in the conservative management of spinal deformity. A thorough understanding of current research & research methods is of invaluable benefit to the treating clinician. In addition to providing solid evidence about current treatment methods, it suggests opportunities for future innovations in spinal rehabilitation and wellness promotion strategies. 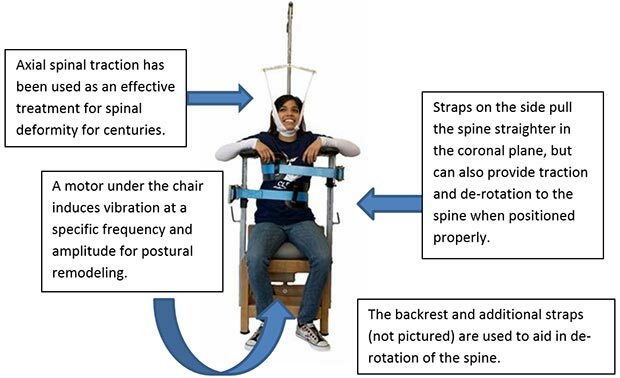 The Scoliosis Traction Chair is an example of how research can be used to develop new clinical rehabilitation strategies. Rubin C, Turner AS, Bain S, Mallinckrodt C, McLeod K: Anabolism. Low mechanical signals strengthen long bones. Nature 2001 Aug 9;412(6847):603-4. Burr DB: Muscle strength, bone mass, and age-related bone loss. J Bone Miner Res. 1997 Oct;12(10):1547-51. Robling AG: Is bone’s response to mechanical signals dominated by muscle forces? Med Sci Sports Exerc. 2009;41:2044-9. Simoneau M, Lamothe V, Hutin E, Mercier P, Teasdale N, Blouin J: Evidence for cognitive vestibular integration impairment in idiopathic scoliosis patients. BMC Neurosci. 2009 Aug 25;10:102. Manzoni D, Miele F: Vestibular mechanisms involved in idiopathic scoliosis. Arch Ital Biol. 2002 Jan;140(1):67-80. Turbanski S, Haas CT, Schmidtbleicher D, Friedrich A, Duisberg P: Effects of random whole-body vibration on postural control in Parkinson’s disease. Res Sports Med. 2005 Jul-Sep;13(3):243-56. Burnette JB, Ebramzadeh E, Lee JL, Galanti S, Hoffer MM: Incidence of inpatient surgeries in children and young adults with childhood orthopaedic diagnoses. J Pediatr Orthop. 2004;24(6):738-41. Stokes IA, McBride C, Aronsson DD, Roughley PJ: Intervertebral disc changes with angulation, compression, and reduced mobility simulating altered mechanical environment in scoliosis. Eur Spine J. 2011 Oct;20(10):1735-44. Aubin CE, Dansereau J, de Guise JA, Labelle H: Rib cage-spine coupling patterns involved in brace treatment of adolescent idiopathic scoliosis. Spine 1997 Mar 15;22(6):629-35. Perdriolle R, Le Borgne P, Dansereau J, de Guise J, Labelle H: Idiopathic scoliosis in three dimensions: a succession of two-dimensional deformities? Spine 2001;26:2719-2726. Tredwell SJ, Sawatzky B, Hughes BL: Rotations of a helix as a model for correction of the scoliotic spine. Spine 1999 Jun 15;24(12):1223-7. Labelle H, Dansereau J, Bellefleur C, Poitras B: Three-dimensional effect of the Boston brace on the thoracic spine and rib cage. Spine 1996 Jan 1;21(1):59-64.
de Jonge T, Dubousset JF, Illes T: Sagittal plane correction in idiopathic scoliosis. Spine 2002 Apr 1;27(7):754-60. Kadoury S, Cheriet F, Beausejour M, Stokes IA, Parent S, Labelle H: A three-dimensional retrospective analysis of the evolution of spinal instrumentation for the correction of adolescent idiopathic scoliosis. Eur Spine J 2009 Jan;18(1):23-37. Kumar K: Spinal deformity and axial traction. Spine 1996 Mar 1;21(5):653-5. The Scoliosis Traction Chair is one part of a comprehensive program which is designed to improve posture, reduce muscle imbalances, and re-align the spine. Together with the exercises and other therapies, it can be very effective in strengthening the muscles along the spine. Once scoliosis has progressed to a certain level, while it may be possible to reduce and stabilize the curvatures, it is unlikely that the spine can return to being completely straight without resorting to spinal fusion surgery. Is there a traction chair in canada and where? The Scoliosis Traction Chair is available in Canada and around the world. However, to ensure patient safety and positive results, it is only available to patients under the care of a CLEAR-certified doctor. Visit the Find a Doctor page to locate the CLEAR doctor closest to you! You can only obtain the Scoliosis Traction Chair if you are under the care of a CLEAR-certified Doctor. To find the CLEAR doctor closest to you, please visit the Find a Doctor page (https://clearscoliosis.wpengine.com/find-a-doctor/). Hi, Where in South African can I get the chair? The Scoliosis Traction Chair is available for purchase through your CLEAR Certified Doctor. It cannot be purchased except by patients who are under the care of a CLEAR chiropractor. Is the chair a available in Sydney Australia? The Scoliosis Traction Chair can be shipped anywhere in the world, but is only available to patients who are under the care of a CLEAR Certified Doctor. I use an STC at my Clear certified chiropractor’s. Can you tell me what the chair with motor attached weighs, as I am thinking about purchasing one for home use, for use with the adjustments by my chiropractor, and my maintenance exercise program. All, of course, under instruction and care of my Clear certified chiropractor. Also, besides weight, would you have the size or dimensions of the chair when put together, and is the electric motor configured with copper wiring or aluminum wiring? The chair weighs approximately 134 lbs (61 kg), and measures around 34″ tall by 24″ square. For more information about the technical specifications of the Scoliosis Traction Chair, please reach out to Vibe For Health (www.VibeForHealth.com) at care@vibeforhealth.com, or (866) 520-4270. Congratulations on taking your care plan to the next level!